At Art in the Park we aim to involve people of all ages and abilities in designing and making art work at our studios and outdoor sites. Encourage and motivate all ages to work towards environmental improvements in inner city London. Give a positive experience of seeing and being in the natural world. Work with people of all ages and abilities in visual arts by using open space as an inspiration and a resource. 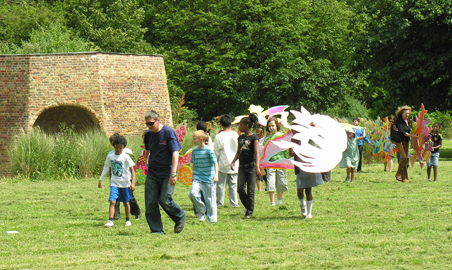 Located in the centre of Burgess Park in South East London and run by practising artists, Art in the Park works with schools, community groups and professional teams on tailor-made educational art and heritage projects and training days. We also work with the public in creating permanent public artworks. Take a look at our history of artworks and events. And find out how you can work with us. More about the area surrounding Art in the Park, beautiful Burgess Park. Meet the artists and volunteers who make the work Art in the Park does possible. Find out more about the Art in the Park studio, our facilities and how you can use the space.